In 2015, A-Alpha Waveguide acquired a fourth building now totalling over 25,000 square feet. The new building, adjacent to the original facility, will house a dedicated machine shop to make our in-house tooling for cast bends as well as the waveguide. Since our inception over thirty years ago, A-Alpha Waveguide has led the telecommunications industry by offering a vast inventory of readily available materials such as aluminum, copper and bronze waveguide tube as well as invar, stainless steel, and coin silver waveguide tubing. 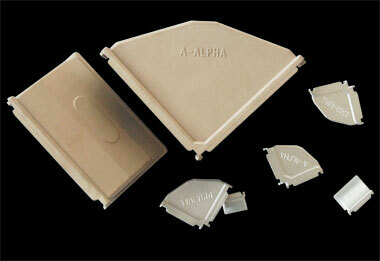 Additional products offered include aluminum flange stock and brass and beryllium copper flexible waveguide. Our experience and commitment to maintain the highest quality product and service has allowed A-Alpha Waveguide to be an industry leader, and your best choice for waveguide and special close tolerance tubing. There are two types of tubing processes: extrusion and cold drawing. In the extrusion process, the aluminum billet is heated to at least 8OO°, pushed through a die, then flooded with cool air. This drastic temperature change causes the shape to react with non-symmetrical, shrinkage and the sidewall to belly in. At A-Alpha Waveguide, we utilize a superior process of cold drawing, in which the tubing is pulled through a hardened steel die at room temperature, allowing for very close tolerances and a higher quality product. • The grain structure of the material is refined, creating a uniform composition. • The dimensions are firmly set. At room temperature, there is no heat related contraction to affect dimensions. This process is similar to coining a dime, where the raw blank is struck heavily and the metal takes on the exact shape of the coining die. Cold drawing allows us to flawlessly hold the shape and the tolerances each time. The fine grain structure has many advantages as well: the tube is more malleable and can be flanged, pierced or formed more radically without splitting. This process also induces fewer internal stresses and the tubing is therefore affected far less by any stress relieving function, such as asymmetrical machining or piercing. This characteristic saves money since other methods require reworking parts after fabrication to meet the drawing specifications. Quality terms for purchase orders.